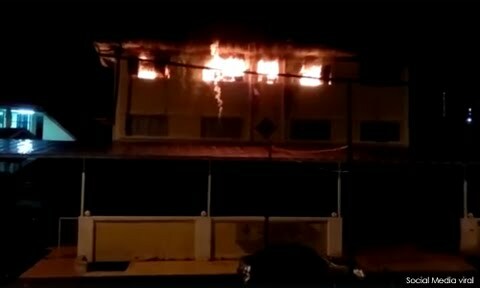 "Bangunan ini juga belum ada kebenaran untuk beroperasi daripada pihak bomba," katanya. I am furious and outraged. The tragedy which unfolded and the deaths of 25 children and teachers points again to unsafe premises and again, I'm quite sure, there were no child protection policies or safety mechanisms in place. We have shelters and day care centers so I know what are the legal safety requirements which need to be in place before we can even get a license to take in children. God forbid, we open a center without a license! We'd be liable and completely responsible for any injury or death. Somehow ( and this is what makes me livid) we are not allowed to ask about child protection policies or safety rules and regulations if it's a religious school. Why? Why can't we ask? You take in poor children most of the times and they pay fees, no? Don't these schools have a responsibility to the parents and families, communities and the general public? Why isn't a tahfiz school accountable to protecting children? Are you above the law because you' re a religious school? I'm still hurting and seething from the deaths of the 14 children and teacher from the last tragedy. The landslide that toppled that religious school. The school moved and reopened with no accountability and responsibility. I demand a full investigation and that if precautions and safety mechanisms weren't in place, that the school be charged to the full extent of the law. I cannot imagine burying your children, trapped by fire. If it's true that the gates and doors were locked from the outside, I want a pole in a room with the the person with the key- you can lock us in from the outside! Let me at him if justice won't be served. Wake up, everybody. Enough is enough. Anyone responsible for negligence, who takes in children and has no child protection policy and safety rules and regulations must be charged to the full extent of the law. Justice here ( not in the hereafter, alone) must be served. And stop sharing the video of the fire and photos of charred bodies. Have some respect for the dead. They deserve some dignity. Think of their families in this horrible horrible time.